Today, I am so pleased to have Susana Ellis join me on my blog to speak of one of a Christmastide’s long-lasting traditions. To celebrate her appearance, Ms. Ellis has generously offered a special giveaway to accompany her post. Enjoy the post and do not forget to comment below to be in the running for the giveaway. Wassail, a hot mulled cider, originated in southern England (apple growing country) in pagan times, as a ritual to ensure a good apple harvest. Traditionally, wassail was made with sugar, cinnamon, ginger, and nutmeg added to cider, often served with toast on top. As time went on, wine became the base, often with brandy or sherry added, as well as apples and/or oranges. Wassail would be served in a bowl, with slices of toast to sop it up. Although the traditional day to serve wassail was Twelfth Night (the evening of January 5th)*, it was not uncommon for hosts to have a bowl of wassail on the sideboard for holiday entertaining during the entire twelve days of Christmastide. In the Middle Ages, peasants would come to the estate of the lord of the manor singing “Here We Come A-Wassailing” and the lord of the manor would reward them with food and drink in exchange for their goodwill. In A Twelfth Night Tale, Lucy Barlow and her sisters take part in the village wassailing procession, but Lucy has to leave early for Livingston Manor to dress for her part as Lady of the Manor. When the wassailers arrive there for their last stop of the evening, she and Andrew Livingston greet them with a sumptuous spread of food and drink, including wassail. When the revelers return to their home, the Livingstons and the Barlows share a private party, with a King Cake (See December 16th post) and charades. And perhaps another surprise or two. 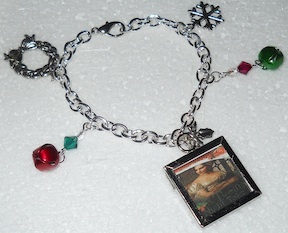 A random commenter on this post will win A Twelfth Night Tale Christmas charm bracelet. *Most of those who still practice orchard wassailing insist that January 17th (old Twelfth Night) is the proper date. Susana is going all out to celebrate the release of A Twelfth Night Tale! 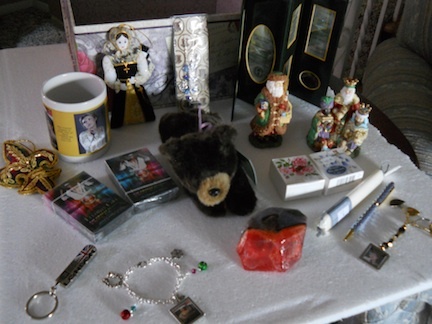 Besides the Grand Prize—a Giant Treasure Box—she is giving away a Twelfth Night Tale Christmas charm bracelet (silver-plated) for one random commenter on each of the twelve stops of the tour. Click here for the Rafflecopter for the Giant Treasure Box! *In lieu of the treasure box, a winner from outside the U.S. will receive a gift card from the book retailer of their choice. This entry was posted in British history, food and drink, Great Britain, holidays, real life tales, Regency era, Uncategorized and tagged A Twelfth Night Tale Christmas, giveaway, Susanna Ellis, Wassail King and Queen, wassailing. Bookmark the permalink. Great post, Susana. I’ve got an old recipe for Wassail that I made once, no one liked it. I am pleased to have Susana with me today. We both could use the Wassail today. She’s in the upstate of Ohio, and even in North Carolina today, we were down to 18 overnight. Brrrr!! Thanks so much for having me on your blog today, Regina! The wassail is just what I needed this morning! I don’t host authors often so I hope your day goes well. I am always pleased to assist a friend. Oh, you’re so sweet, Regina! I’m honored to be your guest today! Actually, I’m in Florida (don’t throw eggs at me), but I did have to turn on the furnace this morning! I can’t blame a woman for warming her toes in the sand, Susana. I knew you would find this delightful, Elizabeth. I wish you well in the giveaway. Isn’t it fun, Elizabeth? I LOVE giving things away at Christmas! Oh yes, Mama Barlow isn’t very subtle. But she does have five daughters to marry off, and at least she’s not as ditzy as Mrs. Bennet in P & P! Despite her over zealous nature, Mrs. Bennet was very practical. She is a short period of time to see each of her daughters to a good match. With a fortune, her options were quite limited. Very informative info on wassailing. Didn’t know about the January 17th belief about Twelfth Night! Eva, I am pleased you joined us today. My family didn’t have any traditions for wassail, but we did eat a turkey dinner. I am curious about what Lucy Barlow gets to do as Lady of the Manor, and why she gets the part instead of Andrew’s mother. Sounds like a great read! Unfortunately, Andrew’s mother is dead. His sister was supposed to be Lady of the Manor, but…well, you’ll have to read the story to find out why she couldn’t do it. Thanks for dropping by! Hello, June. I do believe you would enjoy this tale. Sign me up for this book pls!!! Hello, Daphne. We are pleased you enjoyed the post. I wish you well with the giveaway. Hi Daphne! You’re the random winner of the A Twelfth Night Tale Christmas charm bracelet! Send me your mailing address at susanaellisauthor@gmail.com and I’ll brave the post office to get it to you ASAP! Book looks great can’t wait to grab and read it 🙂 As for a family tradition like the one above, we don’t have one 😦 I have never even been caroling. I love to sing Christmas songs but me and my mom are the only ones who really enjoy that so we do it when we make cookies or stuff 🙂 I would love to go wassailing sometime it sounds like so much fun! We used to go caroling in Girl Scouts! Always had hot chocolate afterwards! And cookies too! No wassail, though! Thanks for dropping by, Erika. I don’t think I ever went caroling with the Girl Scouts although I was in it for quite a few years. I must say though if I make wassail it WILL have the alcohol in it LOL! Thank you Susana 🙂 Congrats and Happy Holidays! What a fabulous post! I turned up late as usual, but what a treat! Thanks so much for sharing, Susana and Regina, it really made my day! Have you had wassail, Joana? I know you are in the UK. Thanks for dropping by, Joana! Very interesting and informative post! I’ve never heard of wassail before, so I thank you for sharing. You’re welcome, Felicia! Thanks for dropping by! And I learn something new again. 🙂 “Wassail” is a funny word to me. I always heard the song and assumed it meant singing. LOL. I’ve never had Wassail either and thought it would taste kind of fruity. Someday. 🙂 Have loved the tour with the excerpt and info. An exciting giveaway. Happy Holidays everyone. A Twelfth Night Tale sounds like a very pleasing read. I’m adding it to my TBR list! I like hot cider occasionally, and maybe I’d like the apple cider based Wassail. Even though I do like a glass of wine, I don’t think I’d like the wassail based on wine, brandy, and sherry. In Regency Christmas times, did gentlewomen drink Wassail — at balls and parties, for example — or only men? Thank you. 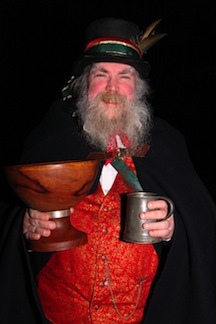 Men and women enjoyed wassail, mdaviswrites. Not just at parties, but also to visitors. People used to visit neighbors and friends quite a bit during Christmastide. Not all the crazy shopping! Thanks for dropping by!